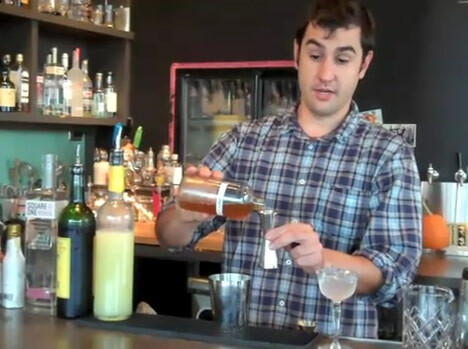 Bartender David Shenaut in action! Just in case you’ve been living on Newt’s moon colony for the past six months, the Super Bowl is this Sunday. So it’s definitely time to get your shopping list together for that big party you’re throwing. Beer, nuts, chips—these are things your grateful friends will pick up at Plaid Pantry on the way over as their meager "contribution" to the pigskin party. As the host, it’s up to you make the cocktail decisions. Yes, you could try to make it through the endless coverage of this sacred broadcast with beer only, but it’s not worth it. Not if you want a positive Twitter reaction, and I know that you do. I queried some of the city’s top bartenders for can’t-miss cocktail recipes for Super Bowl Sunday. In fact, I got enough to parse them throughout the week. Lucky you! Needless to say, if you have a cocktail that’s a real wowser, please send it along. Don’t leave all the fun to the professionals! The first recipe comes from the incomparable David Shenaut, who’s worked behind the stick at Zeus Cafe, Beaker and Flask, Teardrop Lounge, and Rum Club, just to name a few stops. He’s also a past president of the Oregon Bartenders Guild, so this man knows his way around a jigger. "The Souracher is an equal parts drink so you could batch this up ahead of time," Shenault says. "Put the rye, vermouth, lime, and campari all in one bottle and let your guests shake 2 oz of the mix then top it with ginger beer. This drink is super refreshing and acts as a nice clean dry and bitter balance to those spicy wings and meatballs served on game day. Pink enough for the ladies and whisky enough for the men. Great cocktail to have between beers."